Letter to Mr. D.B. Meacham from Martha Berry concerning Mrs. Emery's will, a request for a list of people contributing to charitable organizations and Martha Berry encourages him and his wife to come for a visit to the schools. 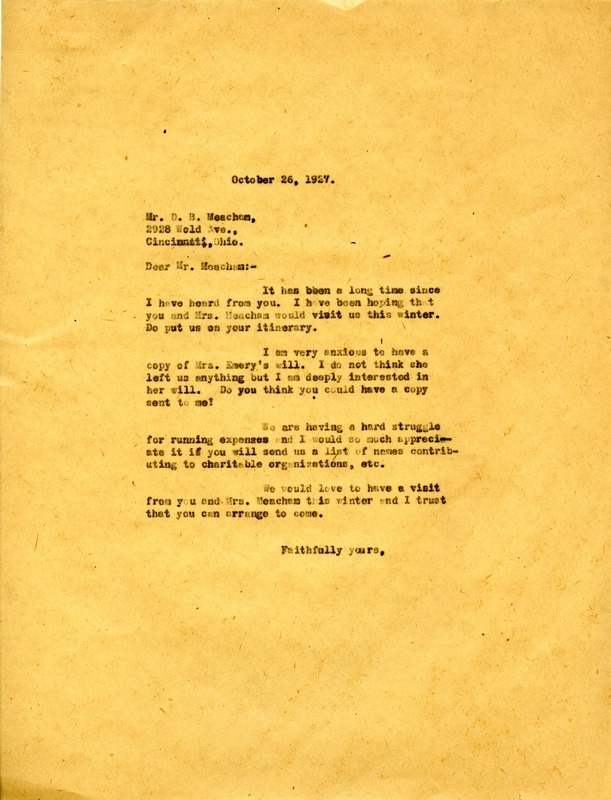 Martha Berry, “Letter to D. B. Meacham from Martha Berry.” Martha Berry Digital Archive. Eds. Schlitz, Stephanie A., Sherre Harrington, Chelsea Risley, Haley Fortune , et al. Mount Berry: Berry College, 2012. accessed April 21, 2019, https://mbda.berry.edu/items/show/5095.